Our rivers determine our land, livelihood, and lives, and the rivers of Des Moines are a force. 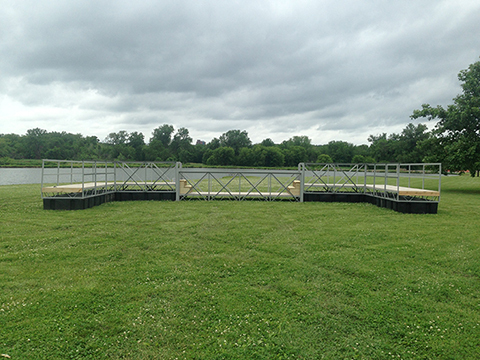 It is with respect, honor, and excitement that we ready to install “Wading Bridge” on the Raccoon River in the coming days. As humans it is easy to forget how very dependent we are on each other, and on the built and more natural worlds we inhabit. Bridges are monuments. Over borders difficult to cross, they bring us together. Yet some of the elements we see as borders may not need to be, and it may be time to redefine them. To explain “Wading Bridge” is to explain the Value of both perceptual and physical experience, and the important practice of re-seeing. Crossing “Wading Bridge” and getting our feet wet can allow us a momentary intimacy with the Raccoon river. For me, “Wading Bridge” is about living with tumultuous change. Sometimes our bridges may be under water, but in unexpected ways they will still bring us together.